Your journey begins by meeting at our Whittier office on Triangle Loop at 9am to outfit with dry-gear and pack your dry bags. 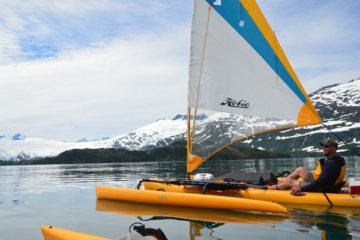 We’ll launch the kayaks and give an instructional talk of use of these unique Hobie Cat sailing kayaks. Once on the water we will hug the rugged coastline for roughly 5 miles to Shotgun Cove to have lunch and explore the beach where there rests a historic shipwreck. 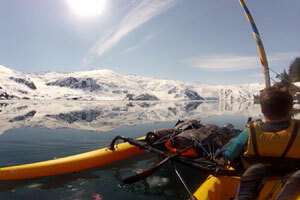 After lunch we’ll continue East along the coast until reaching our destination for the evening at Decision Point*. 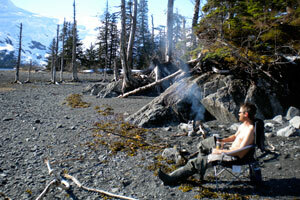 The guide(s) will setup camp and cook over the fire while clients enjoy the natural beauty of this location. After a delicious hot breakfast and coffee/tea we’ll break down camp and kayak along nine miles of stunning coastline, stopping to view any wildlife (seals, otters, eagles, sea lions or maybe a whale) that presents itself. We’ll have a packed lunch on the go and make camp at 17 Mile, a beach with ample camping spots and stunning views. 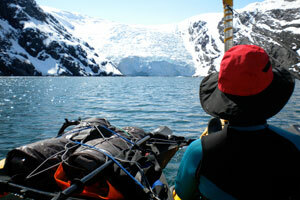 After making camp and having another home cooked meal, we’ll take a light kayak to Lawrence Glacier for a short hike up to view the glacier before returning to camp for the evening. Another hearty breakfast and coffee starts our day followed by packing up all the camp equipment to be left on the beach. Traveling light, we’ll spend the day up close viewing Beloit and Blackstone Glaciers, both are actively calving ice into the ocean! We’ll enjoy lunch on the beach with an amazing view of Blackstone Glacier before returning to our previous campsite where a water taxi will pick us up and return to Whittier. A farewell dinner at the Inn at Whittier is a great optional finish to an amazing adventure. COST – $1,050per person plus taxes, fees and water taxi (estimate taxi fee $600). 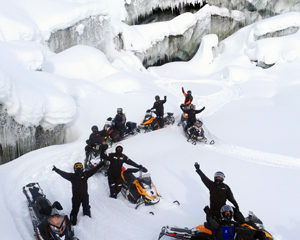 Price includes all equipment, fuel, food (except farewell dinner and alcohol) permits and professional guide service.